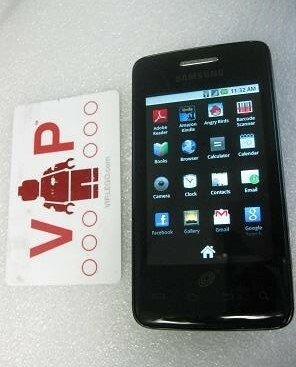 The Samsung Galaxy Precedent was the answer to the question, "When would Straight Talk offer an Android phone?" The 2011 introduction of this smart phone was an event and raised some interesting questions due to past limitations in their prepaid phones? Questions such as . . . Would you get access to all the cool apps? Could you make the most of the 3G and WiFi capability? What about the touchscreen, 2 MP camera, and music player. Would the GPS navigation really work? Did I mention that the Straight Talk Android phone requires the $45 monthly plan which includes unlimited voice minutes, messages and data? Okay, maybe you hoped to use it with the $30 plan, the reality is that if you like using apps, surfing the web and keeping up with Facebook, then the $30 plan probably wouldn’t have been enough for you anyway. Still $45 per month for a plan which includes unlimited data is a really good deal because unlimited data isn’t even currently available from any AT&T or Verizon contract plan. Coverage for this phone is provided by the Sprint Network. Sprint’s network is not quite as extensive as the Verizon and AT&T networks. So you want to make sure that Sprint has good coverage in your area before you get this phone. To find out the coverage area for actually using the phone, you get a better idea by checking the coverage on Sprint's site. There you can see both voice and 3G data coverage down to the street level. You might want to check out the locations where you'll be spending most of your time, such as your home, work or school. Note: If you need coverage from one of the other networks, check out my list of Straight Talk smart phones arranged by network. You’re getting this phone so you can run Android apps and Games so you may want to know what you can install. The Galaxy Precedent comes with version 2.2 of the Android operating system installed. I’ve found that you can install most of the apps and games available. Nielsen published a list of the top 20 Android apps based on user-research. I took a look and saw that about a third of those were pre-installed on this phone, and I was able to find and install the rest. All of them installed fine on this Straight Talk Android phone. Only the Barcode Scanner app (# x on the Nielsen list) didn’t seem to work properly on this phone – I couldn't get it to recognize any bar codes - I’m not sure why. (Update: it doesn't have an autofocus camera.) I was able to install a QR-code reader however that works fine (for some QR codes). Everything else from the Kindle to Pandora to the Weather Channel worked. Many of the most popular Android apps are, of course, actually games. There are tons of games to choose from. I installed the standard Angry Birds, and it worked fine, but subsequent versions such as the Seasons and Space do not run on this phone. Note apps do crash and games do freeze from time to time. When that's about the happen, the phone tends to vibrate a couple of times before the app goes down. Not to worry, you can just restart it. If that's a big issue with you, you may want to try one of their more recent phones. After a fine round of running apps or games you might want to take a break and . . . The music player almost gets lost amongst all the other great features, but it’s there. You can listen to your favorite songs on the built-in music player. You can organize your favorites by artists, albums, songs and playlists. These songs are stored on the SD card. If you want to listen to music online instead, you can download separate music apps such as the (free) Pandora app or the (paid) Napster app. The YouTube app works well on this phone. The videos play pretty smoothly, though they do buffer if the signal is weak. It's even better if you have access to a WiFi network. Not only can you watch videos, but you can also upload the videos you take directly to YouTube using the YouTube app. Of course, you don’t have to record videos. You can also take photographs. Because the Precedent was released in late 2011 though it is still available now. It's probably more useful to compare it to no-contract phones that became available at about the same time. The LG Optimus Q cost about the same as the Precedent but had a QWERTY slide-out keyboard. In contrast the Black had a front-facing camera and a few slightly better features. Looking at smart phones under $100 gives you a pretty good idea as to what's available today. If you want smart phones with parental controls, you may want to consider Kajeet.